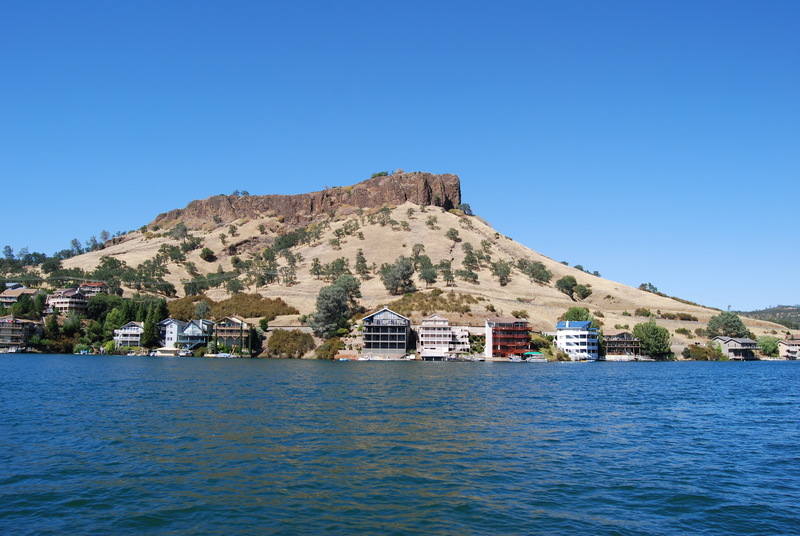 While the Lake Tulloch / Copperopolis area is a vacation destination for many, there are also a lot of interesting activities to explore just outside of town. 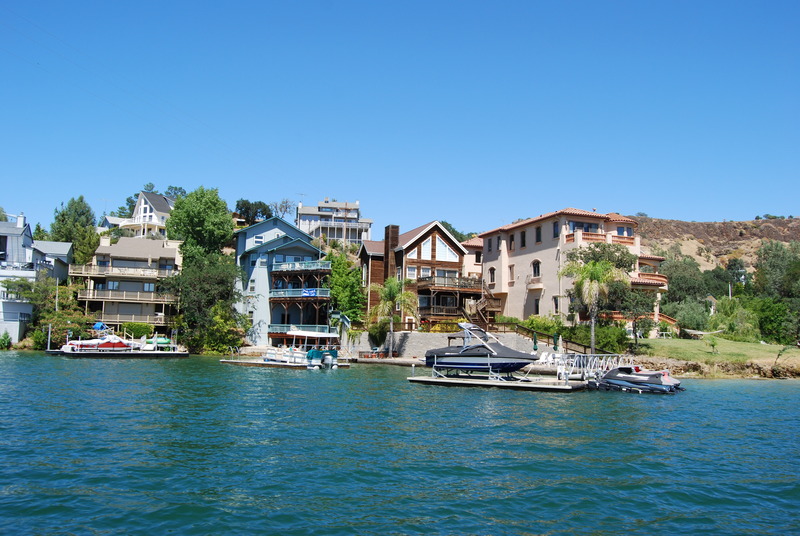 Lake Tulloch is a great place to take a "mini vacation' from your second home. If you live here full time, the local activities will make sure that you will always have something fun to do. Here are my Top 10 local activities (other than Lake Tulloch). Located in Copperopolis, is one of the most highly regarded golf courses in the region. Saddle Creek features 18 scenic holes and is ranked 8th by Golf Week Magazine for Best Public Access Courses in California. 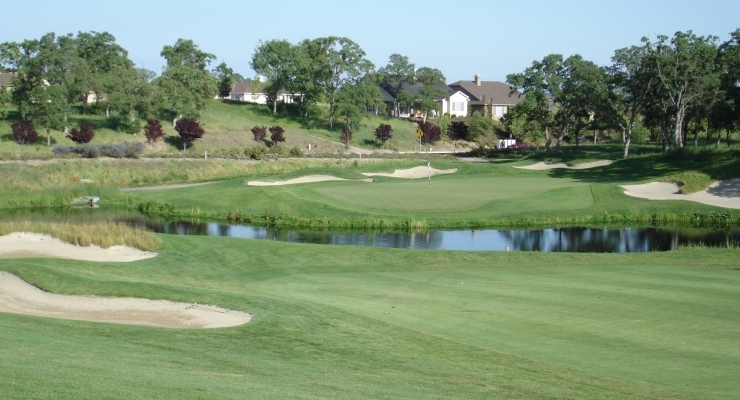 Also located just 12 miles from the Lake Tulloch / Copperopolis area is the Greenhorn Creek Golf Course. Greenhorn Creek has been voted "Best Playing Conditions" and "Best Value for the Green Fee" by Greenskeeper.org. 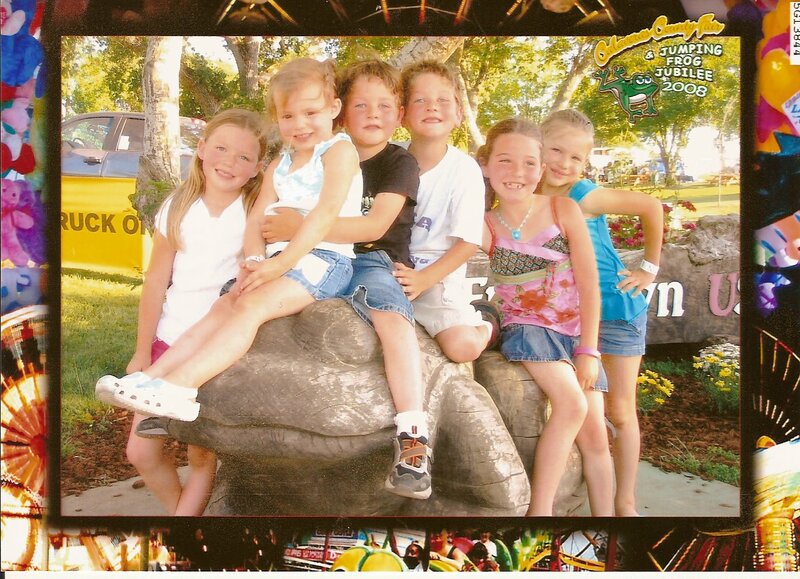 The Stafford and Caywood Kids at the "Frog Jumps". "The Frog Jumps" as it is referred to locally, dates back to the 1800's and was the inspiration of Mark Twain's first published work, "The Celebrated Jumping Frog of Calaveras County". Where else in the world can you "jockey" a frog, hoping to set a World Record? Only in Calaveras County. It is definitely something that everyone should experience once in their life. While I was torn placing a world known event closer to #1, it comes in at #9, because I personally think that the pricing is terrible. When I was a kid, your entry fee included all of the rides which was great. Now it is a ticket system for rides that generally cost a buck a ticket and some rides were three tickets or more. With three kids, at nearly $10 a ride, I would rather go to Disneyland. The "Frog Jumps" are held annually the third weekend in May at the Calaveras County Fairgrounds. For more information visit their website. Murphy's is quickly becoming a destination for wine connoisseurs. Anchored by Ironstone Vineyards, Murphys features many great wineries including Twisted Oak and Stevenot. Besides wineries, there are many great bed and breakfast places to stay. My favorite is the Victoria Inn which features a "Miner's Exchange" style, blending history with modern comfort. Each room is an eclectic mix of wonderful European charm, featuring high ceilings and doors, fireplaces or wood stoves, claw-footed bathtubs or whirlpool tubs. For a complete list of wineries and places to stay, please click here. 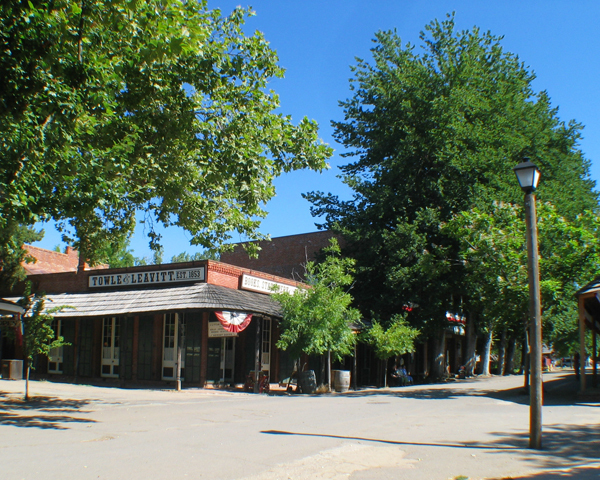 The town's old Gold Rush-era business district has been preserved with shops, restaurants and two hotels. Visitors have the chance to time-travel to the 1850s, imagining life when gold miners rubbed shoulders with businessmen and the other residents in Columbia. Visitors can experience a bygone era watching proprietors in period clothing conduct business in the style of yesterday. There are opportunities to ride a 100 year-old stagecoach, pan for gold, and explore the real working businesses of Columbia. I remember as a youth when Columbia was used as a backdrop for the Clint Eastwood movie, Pale Rider. You can't beat the old fashioned candy store and getting an "ice cold sarsaparilla" at one of the "water'n holes". For more info click here and here. While I was growing up in the area, the best and pretty much only firework display was held out at the county fairgrounds. 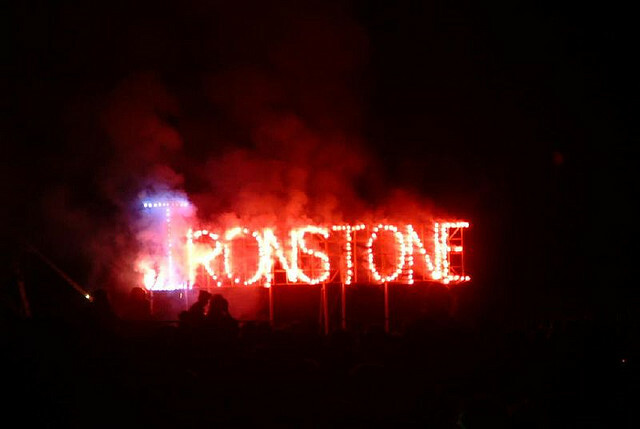 For the last couple of years, we have been going to Ironstone for their Fourth of July Celebration. There is live music, climbing walls, bounce houses, all sorts of food, Cruiser's Ice Cream, and much more. It is my favorite one day event of the year. The fireworks show is one of the best and longest that I have ever seen. If you haven't tried gone yet, go this year! I promise that you will be impressed! While it seems that most people are either a Pinecrest person or Lake Alpine person, I am definitely the latter. Pinecrest and Lake Alpine are similar but in my opinion, there is a lot less people and traffic at Alpine. 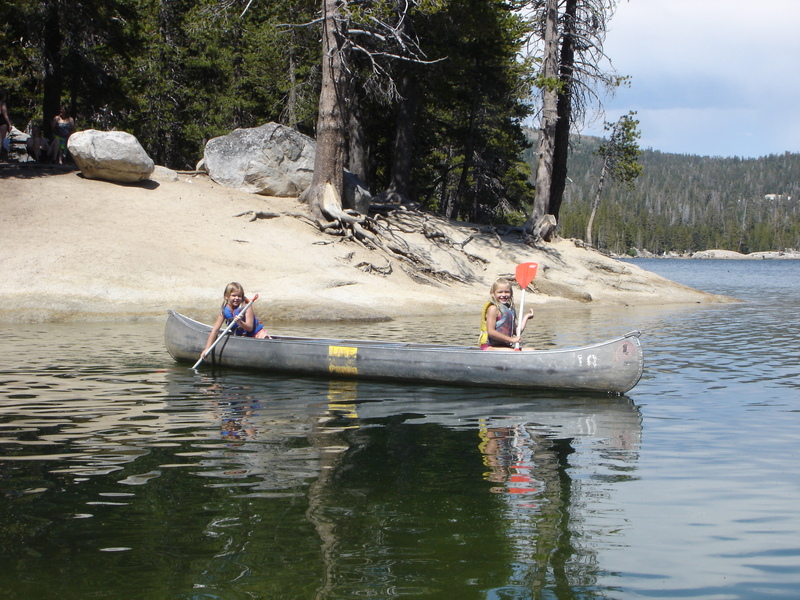 The lake is crystal clear and great for canoeing, fishing and swimming. The campgrounds are well kept and the general store/restaurant is great for the things that you may have forgotten. I have camped at a lot of places and Lake Alpine is my favorite because of Slick Rock Road/Trail. Slick Rock Road winds through dense trees over huge granite slabs from Lake Alpine to Utica Reservoir. It is a trail for 4x4 vehicles only and I would only attempt it if you are serious about rock crawling. While I ran the trail end to end in a stock Rubicon Unlimited, I would not recommend this unless you have some off road experience. It isn't the "Rubicon", but it is nice because it is relatively close and great because of the camping at Lake Alpine. I have been going to the Moaning Cavern since I was 9 years old. It is one of the area's best natural (under) landmarks and you must check it out if you haven't seen it for yourself. 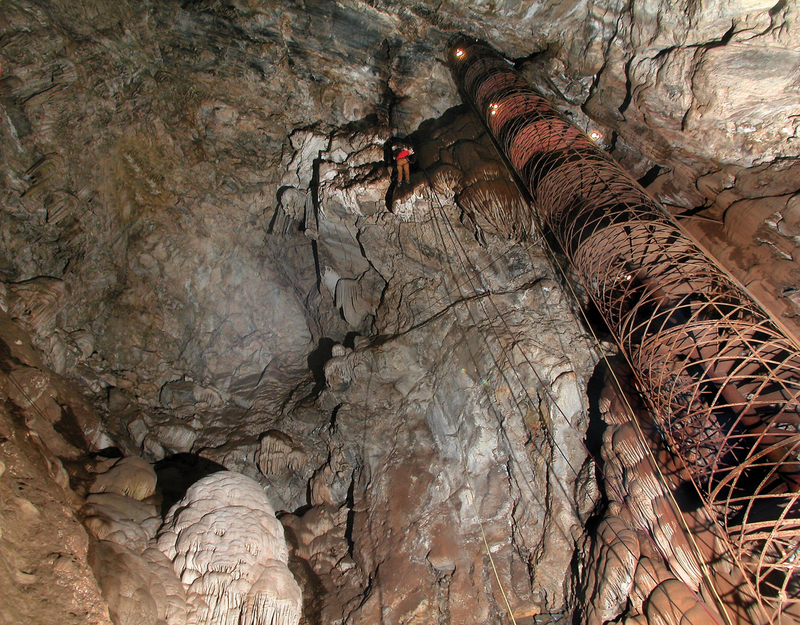 It is a cavern so large, that you could actually fit the Statue of Liberty into it. There are multiple types of tours but I like the basic walking tour. It is awesome and the kids really like it. Recently they added some ziplines that I hear are really fun, but I have yet to try them. 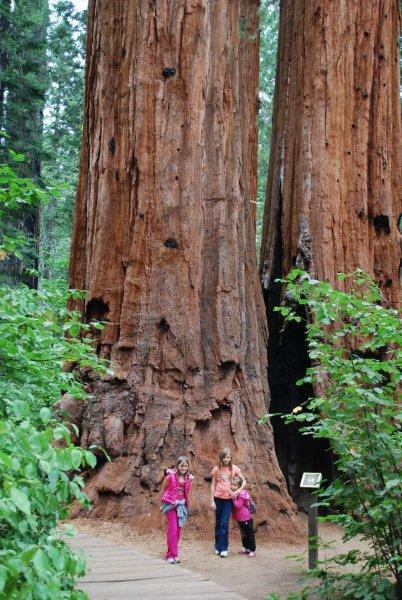 I think that Big Treesis often left out of conversations about the massive redwoods in California. People talk about redwood groves near the coast and not much is mentioned about the massive redwood trees right here in Calaveras County. The trees are massive and you don't have to travel half way down California to get there. There are many different hikes to take, but they are generally pretty mild and the sights are fantastic. I have grown up going to both ski resorts and I really like them. "Dodge" is closer, but I have gone to "Bear" more often. Either is a great choice. Both offer great ski schools and all the amenities that you would hope for. The Challenge is to snow ski at Bear or Dodge, and water ski at Lake Tulloch on the same day. 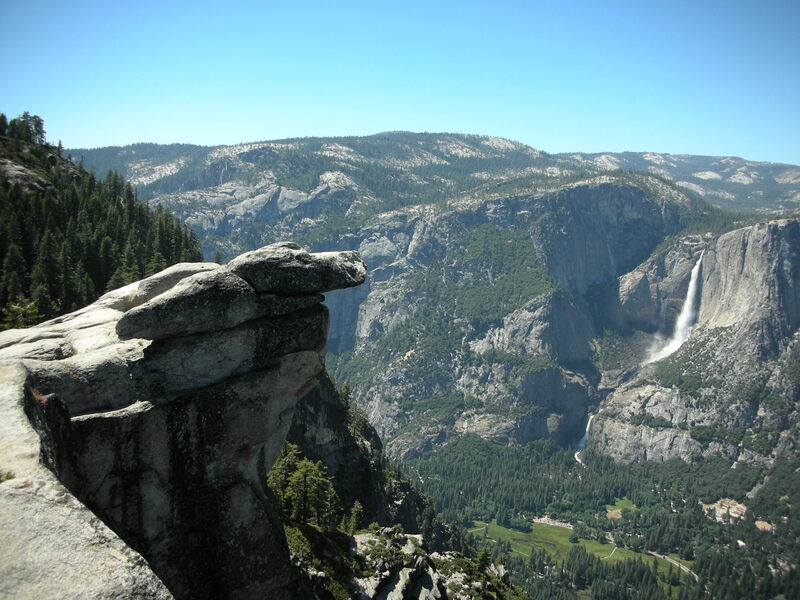 I am embarrassed to admit that I grew up in Calaveras County and I never visited Yosemite until I was into my 30's. In 2006, I went there with my family and I could not believe that I had missed out on something so beautiful for all of those years. Maybe it's something that you appreciate more as an adult, but I really love the place. I went there and felt like Ansel Adams, snapping unbelievable pictures of the park. You can't take a bad picture! Everything is breathtaking. My favorite part of the park so far is Hetch Hetchy Reservoir, which is a bit out of the way from the main park, but well worth the trip. Across the Dam at Hetch Hetchy, a hike begins, taking you through a tunnel and around the lake. A few miles in, there is a waterfall that washes over an elevated wooden walkway and it is awesome. If you go to Yosemite, you must check out Hetch Hetchy. If you haven't gone, go now because you are missing out. As a 27 year resident of Copperopolis, I have seen a lot change over the years. As we have grown, the amount of activities have grown for the area and here are my Top 5. 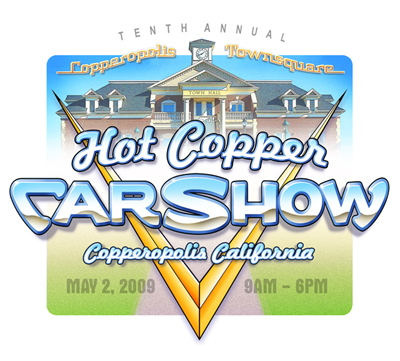 Sponsored by Lake Tulloch Lions Club, the Hot Copper Car Show is now held in the Copperopolis Town Square. The car show, now in it's 11th year has grown every year and now features more than 200 custom and classic cars from all over the state. Pictures from last years show can be seen at ThePineTree.net . Last year, the event featured a fun day of family entertainment including a vintage auto and motorcycle show, mechanical bull riding, ice cream eating competition, live music, silent auction, raffles, poker walk through local business establishments and more. The show is generally held in May and all proceeds benefit local charitable work, local food bank and local high school scholarships. Copper Valley Trail Company provides unique riding experiences year round. 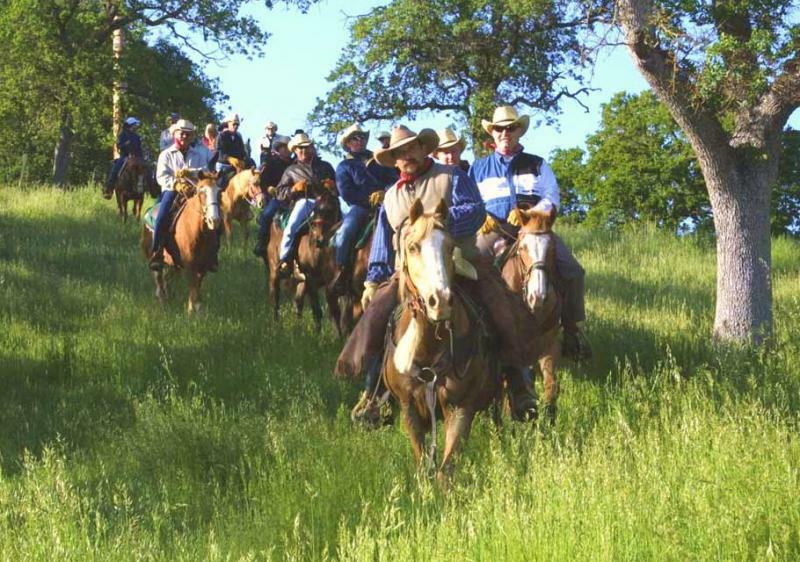 They feature thousands of acres of beautiful foothills to explore on fabulous horses and mules, all on private historic ranch land. On the trails you will enjoy meandering creeks, gorgeous year-round ponds, as well as the only riding trails on the beautiful shores of Lake Tulloch. It's a great way to make a special family memory and take the foothill experience a little 'bit' further! Call or come by their Trailhead Store at 403 Town Square Road or call (209) 785-9801 to book your riding adventure! Generally, The Copperopolis Town Square features live music at most of their events. 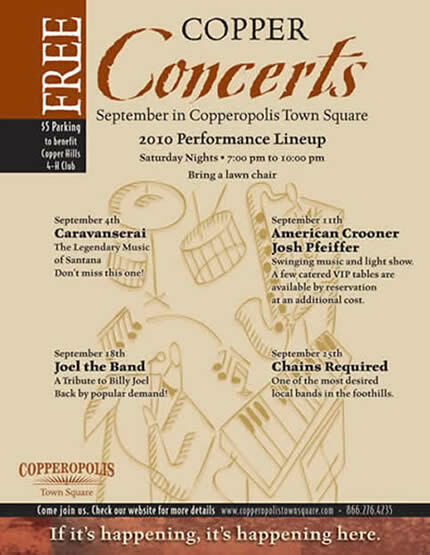 The best concerts are generally held in September for the "Copper Concert" series. Last year, was the best line up yet, featuring Caravanserai, Joel the Band, Chains Required and local favorite, Josh Pfeiffer. Held on the gazebo in the park, there is plenty of seating and great views of the bands. The streets of Town Square are blocked off during these events so it is safe for families with children. Saddle Creek Resort is truly a golf resort for players and couples of all levels. The golf resort features 18 scenic holes and is ranked 8th by Golf Week Magazine for Best Public Access Courses in California. 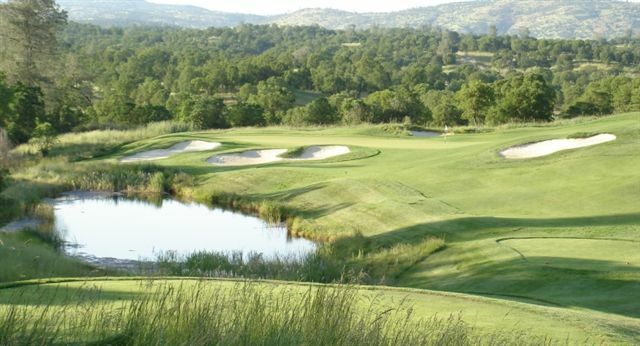 While Copperopolis is generally know for Lake Tulloch, Saddle Creek has put Copperopolis on the map for avid golfers. Information about homes and homesites is also available on my website at Saddle Creek Resales. Call (209) 785- 7415 for tee times. Lake Tulloch is known mainly for it's waterfront homes. Since most lakes are state owned, lakefront living is a true rarity in California. Lake Tulloch is also features an inlet and outlet dam so lake levels are controlled and maintained. Each day the lake fluctuates 1-3 feet as the dams release water to generate power, which in turn, keeps the lake fresh. For a more details about the lake click here. Lake Tulloch is great for anything that you could want to do on a lake. Waterskiing, wakeboarding, kneeboarding, wakesurfing, tubing, jetskiing, fishing, paddleboating, swimming, kayaking, canoeing, pontoon boating, floating, lounging, you name it. If it can be done on a lake, it can be done at Lake Tulloch (except parasailing.....big power lines!). You can do all of this from your own privately owned dock. For more information about homes at Lake Tulloch, please visit my website at Lake Tulloch Waterfronts or call me at (209) 840-1432. 5. The Copper Grille at Saddle Creek This has probably been the most consistent restaurant over the last 10 years. Dinners are a bit pricey, but they often have $10 dinner themes that are really good. Breakfast and Lunch are good as well. 4. Snaps Coffee and Wine Bar If I was ranking by how I often I actually go, Snaps would be #1. Since it really isn't a full service restaurant, it sets at #4. I actually PREFER Snaps to Starbucks. Let me say that again, I actually prefer Snaps to Starbucks. I know Starbucks isn't always the greatest to coffee lovers, but it can be counted on for it's consistency. Snaps is better. Hands Down. They offer free wifi which is great for visitors that do not have local access. If you are looking for a lite lunch or breakfast, the also serve an excellent smaller menu. I am a big fan of the Chicken Pesto Panini. They also feature a wine bar with many local wines, and a decent selection of beers. Go there....daily! 3. Drifters Marina and Grill I love this place. This fall, I watched nearly every game of the NLCS and the World Series on their 55" TV. While it really isn't a "Sports Bar" it is a great place to catch a big game. The staff and food is excellent and you can't beat the lakeside location. During the warmer months, a great time can also be had on their outside decks. My favorites items to eat are the garlic fries, any of the pizzas, and the chicken sandwiches. They also have these breaded and fried jalapeno slices that are pretty awesome. 2. Mexico Lindo Esther and family provide great Mexican food at a reasonable price. I like this place because it is one of the rare places where your "special order" becomes normal. I have a lot of items that I have made special and I don't have to explain what I want. They just know. Since I am very partial to my special orders, I will share a few with you. Bean Dip. Wait there is no bean dip on the menu. If you mention that I (Aaron) told you to order the bean dip, they wold bring you a bowl of refried beans, covered in verde sauce, cheese and a spoonful of sour cream. It is so good to go with the chips and salsa. My Favorite are my chicken tacos. It has been awhile since I saw the regular, but I know they are fried with a corn tortilla, and mine feature a soft flour tortilla with great pieces of chunked chicken breast with a perfect amount of their mole sauce, lettuce, cheese and tomato. They also have a great hot salsa that is available if you ask for it. 1.Panini's Italian Grille Panini's is a newer restaurant in the Copperopolis Town Square. If you are looking for upscale dining, then Panini's is the best in town. The service is great and kid friendly. The menu is well rounded but my runaway favorite is the Gold Rush Vegetarian Pizza. I am picky about my pizza, and this is the best vegetarian pizza that I have ever had. 5. Woods Creek Cafe On a weekend, get there early, or be prepared to wait a bit. If you must wait, believe me that it is well worth it. Use the dry erase board to establish your position in line or you might wait a lot longer. Spotted cows, rolls of paper towels mounted to each table and the best breakfast in Tuolumne County is what you should expect. Lunch is good too, but breakfast is best. The "Superbowl" is all you need to know when it comes to the menu. The deserts are also great, along with the handmade chocolate milkshakes. Located on Highway 108 in Jametown. 4. El Jardin There are many El Jardin restaurants in the surrounding area. In order, I prefer the Murphys location, followed by Sonora and then Columbia. The food is fantastic and it is where I stole the idea for my "special" bean dip at Mexico Lindo. As great as the food is, my favorite thing at this restaurant is the fried ice cream. It is the real thing and absolutely delicious. 3. Grounds Grounds is located in Downtown Murphys. It is my favorite place for breakfast, even though I don't have to time to make it up there a lot. The food is fresh and the french toast uses bread that is baked that morning from the bread store a few doors down. It is also open for lunch and dinner, but I personally have always preferred it for a great breakfast. The French Toast with Marionberry syrup is my personal favorite, but the breakfast burrito is great as well. 2. Mikes Pizza I admit that I am a pizza snob. While there is rarely a bad pizza, after eating pizza in Illinois while I was in college, it was hard to adapt back to the pizza in California. It is just not the same. Similar, but only by name and shape. Mike's Pizza is worth the drive to Angels Camp to either eat it there, or bring it home. While it is totally different from pizza in Illinois, it is the best pizza that I have had in California, other than Chicago Fire in Sacramento. Mike's Pizza is thick, the sauce is great (I ask for extra) and the cheese is not greasy. The veggies are fresh and they are always cooked just right. The Cheesy Breadsticks are a must, and if you want dessert, they also have cinnamon sticks which are fantastic. I generally pick it up and bring it home, but my kids love to eat it there and play all of the quarter eaters (video games). 1. Azzo's This is my favorite restaurant period! From opening night until now, it is my favorite place to eat. The restaurant is basically divided down the middle. On one side, you have a full service bar decorated with rock n' roll posters, a large plasma that is always playing live classic rock concerts, and you can always find the personable Azzo behind the bar. The bar is known far and wide for it's "Lemon Drops", but I love it for it's ice cold Fat Tire beer. While the bar area is a little less formal, the dining area is regarded as one of the finest restaurants in the region. Everything is spectacular although I always lean toward the handmade pasta, red sauce and chicken. Go there tonight, but don't forget to call for reservations, it fills up quick!! !